In April, we wrote a post illustrating how remodeling is creatively camouflaged in Beverly Hills. 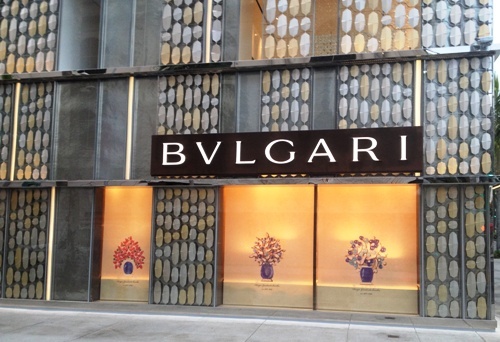 We featured the Bulgari jewelry store who, in keeping with their brand identity, had designed a bright golden opulent camouflage while remodeling their store. True to their identity, the store board was colorful and attention getting. We feel it is spot on its brand signal. It is perfect for who they are! And now, here is the big reveal. They still have work to do. The windows were being washed early this morning. Paper is covering the front door and the windows. No doubt they are working on the finishing touches. 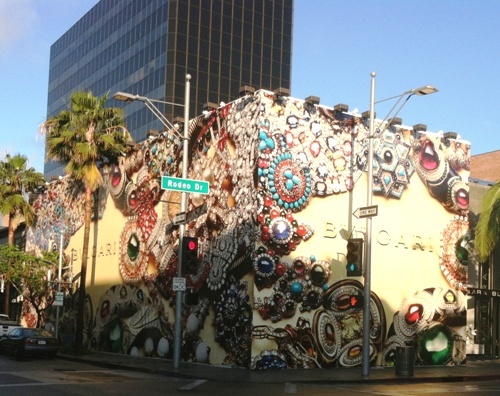 Below is the side view on Brighton Way and Rodeo Drive, and these windows are paintings of the latest brooches they are selling. We thought it was a beautiful store. Here is the detail of what is creating the pattern behind the glass. These are made from metal colored platinum, silver, and gold. The very center has a polished line and there are hung on metal lines positioned to create a pattern. We feel the look is in keeping with their brand, elegant, innovative, and edgy. What do you think?